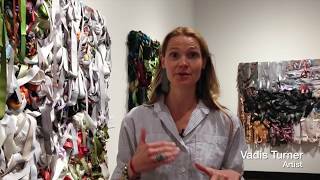 Nashville-born artist Vadis Turner transforms commonplace materials associated with women, such as ribbons and bedding, into bold, textured assemblages that assert the value of female experiences, especially rites of passage. She is also interested in challenging conventional gender roles or, as the artist states, revealing “the underbelly of the female archetype.” This exhibition presents objects surrounding three potential phases of a woman’s life—the young Wild Woman, the Mother, and the Elder—along with a corresponding disturbance or agitation: a powerful storm, scorched emptiness, and the gradual silencing of voice. Turner’s early practice involved making confrontational sculptures from nontraditional items, such as wax paper lingerie and a tampon wedding cake, in a vein similar to that of feminist artists during the late 1960s and ’70s. She returned to her training as a painter around 2011, when she began to construct wall-based works from long strips of recycled textiles. The brightly colored strips are sewn onto woven or quilt backings and stand in for brushstrokes. Turner is partly inspired by the history of women’s creative production, which was once largely through sewing, cooking, and other domestic tasks. Today, many modern women lack the skills or opportunities to make objects by hand. Turner strives to bring visibility to the often-overlooked handiwork of women in the past while simultaneously pushing this legacy forward. Turner (b. 1977) moved back to Middle Tennessee in 2014 after living in Boston and New York for many years. She received a BFA (1999) in painting and an MFA (2000) in studio teaching from Boston University. Turner’s work has been featured in exhibitions in the United States and Europe. She was recently awarded a prestigious Joan Mitchell Foundation grant. Tempest is her first solo museum exhibition. We gratefully acknowledge the generosity of the FRIENDS OF CONTEMPORARY ART.